You are here: Home » Bali Nine judges allegedly “asked for bribes”. Wouldn’t happen in Australia, right? Some people might think it is just lies and a tactic to save the lives of Andrew Chan and Myuran Sukumaran. But that sort of thing happens in Australia so there is a good chance it could be true. Rex Jackson was sent to jail for 3 years for a couple of the bribes but most of it was swept under the carpet by the then Labor Government. People might say the Jackson and Farquhar crimes where 30 odd years ago and it doesn’t happen now. Well the NSW parliament has just had an inquiry and is due to publish a report in the next week or so regarding police corruption. It also included over 20 NSW Supreme Court judges issuing corrupt warrants based on little or no evidence justifying the warrants. So why did more than 20 judges issue the warrants? There must have been some benefit for them to issue dodgy warrants. And of course this website is a judicial corruption site and there are many instances of recent judicial corruption in the other articles on here. I am no fan of the death penalty but I do believe if you commit a crime in another country you have to take the consequences and it is not for us to interfere in another country’s legal system. But the key point is that judicial corruption happens here and clearly happens in Indonesia. So should people be sent to their death when the conviction is possibly tainted? 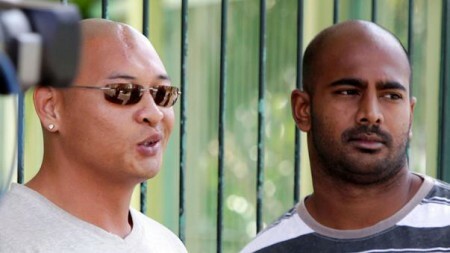 There is no disputing the Bali Nine are guilty of the crimes they have been convicted of. What is debatable is whether or not Andrew Chan and Myuran Sukumaran should have been given the death sentence when the other 7 have been spared. And have the judges acted fairly and honestly? Understandably Andrew Chan and Myuran Sukumaran are getting all the media attention at the moment but the other 7 members of the Bali Nine have almost been forgotten. I think their lighter sentences should be highlighted to put Chan’s and Sukumaran’s death penalty into context because I do not think what they did was any worse than the others. The Bali Nine crimes really needs to be a 10,000 page book, not a short post such as this, but I think the points I make above add some value to the debate. And that is what is happening right now, politicians and the public in 2 countries are debating whether or not 2 people should live or die. The allegations against the Federal Police and their role (as per the below video) is not one of corruption but of pure incompetence and dereliction of their duty. To the best of my knowledge the Federal Police have never fully explained themselves regarding the Bali Nine. Maybe it is about time they did. The video is of former federal police Commissioner Mick Keelty and current Deputy Commissioner Michael Phelan giving evidence for the Bali Nine member Scott Rush death sentence appeal in 2010. Everyone has an opinion on the Bali Nine and if Andrew Chan and Myuran Sukumaran are executed it will have a polarizing effect for the nation. It is a complex issue. People who deal heroin ultimately kill me but does that give us the right to kill them? And if the federal police had not tipped off the Indonesian police regarding the Bali Nine and had waited for them to come back to Australia and arrested them then they would be out of jail now. Its all a strange story indeed (as they usually are), with the moral to the story being “Don’t Deal in Drugs” and if you do Internationally, you will be in the hands of a different culture, paying the price in a way that is completely under their control (corrupt or not)..!! I am sure that we still have Corrupt Judges, Police and Politicians in abundance, with a good dose of incompetency in the mix also, that we need to be worried about and working on …!! “The video is of former federal police Commissioner Mick Keelty and current Deputy Commissioner Michael Phelan giving evidence for the Bali Nine member Scott Rush death sentence appeal in 2010”. So, what’s the connection between Keelty, Phelan & Scott Rush? Does it have anything to do with Scott Rush’s UK banker love interest – Nikki Butler? According to her statement, she only met him once (casually) while in Indo, BEFORE he was arrested!?! How much $money$ was put forward – aka – bribes – to move Scott Rush & take him off the death list? Did anyone note the wedding band on his (Scott Rush’s) left hand in the last photograph depicted here with the love of his life, who he only met once – Nikki Butler >> http://www.news.com.au/national/bali-nine-drug-courier-scott-rush-falls-in-love-with-london-banker-nikki-butler/story-fncynjr2-1226970171142. Corruption is rife – it’s everywhere. The more one digs, the more one finds. We must keep digging. Look forward to hearing more about this, Shane. Thanks for all you do! Please read the link above which has not been reported in mainstream, funny about that. These two were the ringleaders in a criminal enterprise and were prepared to risk young lives to bring Heroin into our country. The seven were spared because they were mules taking the risk for these two. Others before them haven’t been so lucky as this article tells. No sympathy here. It is a fact of life in Indonesia that earnest money can solve many issues including breaches of the law. It saves time and serves as salutory warning/punishment. It is also a fact of Australian law that until a crime is committed and evidence produced there is nothing police can do. Police cannot set people up. There are entrapment laws in place. Whether judges, police, or lawyers receive bribes is not the issue. Drug smuggling is. The real criminal and coward is the fellow in Australia who masterminded the Bali 9 operation. His silence has allowed the whole sorry situation to become politicised and therefore newsworthy. Should the two men on death row turn State’s evidence, name the Australian mastermind to AFP, we could then believe they deserve clemency. Dragging in as many of the dramatis personnae as possible is counter productive and certainly will not work in Indonesia. There is only one person (perhaps a small group) that needs dobbing in. My view is that the whole system is corrupted here and there and I really smell a big fat rat here ,so I am against this execution due to the More than likely corruption that existed then and Now . I was once told by an arrogant cop after doing a U turn inside thirty meters of a set of traffic lights, “Ignorance is no defence in breaking the law” The two Bali nine drug traffickers would have been aware of what they were perpetrating and the consequences,harsh as they are. Politicians crying crocodile tears does nothing for me and if that gains them a few votes from the 48% who say they don’t agree with Indonesian justice, so be it, no sympathy here. What about showing some of the victims of drug deaths parents, or is that moving the goal posts. Allan from Myalup WA. If the current Mercy-Political campaign is successful, will the signs in the airports in Indonesia soon say “Heroin traffickers will be put to death, unless you are Australian, and promise not to do it again” ? I have also read in the S.M.Herald, around about the same time as the above article that when they went before the Supreme Court for an appeals hearing, there was another guy, “Hangky Gunawan’ also appearing on appeal, he was busted running an ÍCE’ factory in Surabaya, his trial was in 2007, found guilty and sentenced to death. They went before the Supreme Court in may 2011 to have there appeals heard. Chan was #37, Sukamayan #38 and Gunawan #39, Chan and Sukamayan’s appeals thrown out and when Gunawan came up next, surprise, surprise, one of the judges on the bench found that the death sentence was unconstitutional in his case for some obscure reason and had his sentence reduced to 15 years, one judge who must have got a bigger ‘back-hander’crossed out the 15 and substituted 12 years, apparently as the story goes he was found out and stood down (struck off?) but the 15 years stood. As I said I read this a week or so ago in the S.M.H. I don’t know exactly how accurate the story was but I have been quoting it in the comments section of the Jakarta Post also Antara (state run media) and other papers since I read it. I would love to know if this indeed happened as it reeks of corruption to ‘blind freddy’ can someone please enlighten me. I fail to understand the claims made that the AFP are somehow responsible for the current situation the Bali nine find themselves in. If indeed the AFP tipped off the Indonesians, that discounts the fact the Indonesians may well have intercepted them without the AFP’s tip off. Blaming the AFP is akin to blaming a victim in a shooting for getting in the way of a bullet! The Bali Nine can’t blame anyone but themselves for the situation which they find themselves in. What needs to be done, must be done. Of course there are still corrupt judges in Australia. Supreme court judge Marcus Einfeld lied under oath – how can anyone forget that! It never ceases to amaze me that the Criminal is the Poor Bloody Victim, and the Victim is the one who is to blame for the Criminals Plight. If the AFP did tip of the Indonesian police/customs about these criminals then OK, I am grateful to know that our Law enforcement is doing some thing towards protecting our children from the scourge of these criminals. I have no sympathy for the likes of these criminals. They are the dregs of society and they wouldn’t turn a hair to any young person who died from their illicit drug dealings. They are the scum of the earth. If Indonesia wants to eradicate the world of these vermin then we shouldn’t interfere, but give them more assistance to do so. Have just been gazing with wonderment at my own (previously compassionate, educated and mature) reaction to the first sight of this this story: the photographs (above) of Chan and Sukamayan.The power of media…. Chan appears to me to need a library of books thrown at him: arrogant, unfeeling, acquisitive and sly… Sukamayan: when I’ve seen him interviewed he has an air of humility certainly lacking in Chan. Unfortunately for Chan and Sukamayan, all this hectoring and bullying talk from Australia about Indonesian justice (yeah, I know) has probably hardened the resolve of the President and the judiciary there to carry out the executions, regardless of allegations of corruption at this or that point in the process. It looks to me like they will be executed by politics now, not Law. We may have made things worse for them in trying to save them via the bully pulpit.